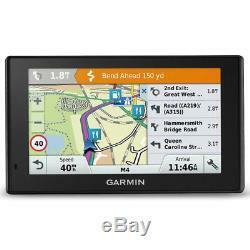 Garmin DriveSmart 51LMT-D UK5 GPS SatNavFREE LifeTime Maps & Digital Traffic. 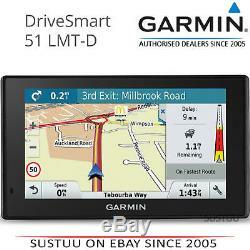 GARMIN DRIVESMT 51LMT-D UK GPS SATNAV. Advanced Navigation with Smart Features. 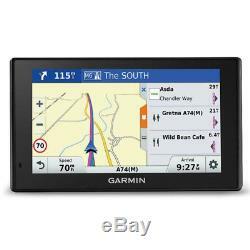 Easy-to-use GPS navigator with connected features and bright 5.0-inch capacitive touch display. Provides real-time services such as live parking and live weather. 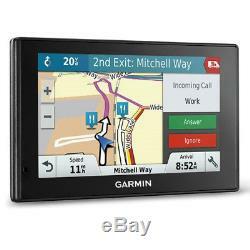 Free Garmin DIGITAL Traffic via DAB - Garmin's best traffic solution - out of the box! Bluetooth calling, smart notifications and voice-activated navigation. Built-in Wi-Fi for easy map and software updates. Includes lifetime safety camera updates. Stay connected behind the wheel with Garmin DriveSmart, the navigator that features a collection of smart features in addition to helpful driver alerts and easy-to-follow directions. From hands-free calling and live traffic information to built-in Wi-Fi and more the future is on your Garmin. Just look ahead and drive. Live Services for Your Drive. Outsmart traffic jams with time-saving alternate routes or by avoiding them altogether. Then, with live information, spend less time looking for a parking space. Get live on-street parking information, up-to-date weather forecasts and more, on your Garmin DriveSmart. As you near your destination, take the stress out of parking by viewing pricing and availability trends for on-street public parking. The Smartphone Link app, Also enables LiveTrack, which lets drivers share their location so friends can track your whereabouts whether you are running errands around town or taking a long road trip. Putting the Smart in Smart Connectivity. When you sync your Bluetooth-enabled smartphone to Garmin DriveSmart, you get great features that let you stay connected without taking your hands off the wheel. Garmin DriveSmart features voice-activated navigation that responds to your commands and then navigates to where you need to go. Wi-Fi Keeps You up to Date. We make it easy to keep your maps and software up to date now that the Garmin DriveSmart navigator features built-in Wi-Fi. When a new update is available and youre on your wireless home network, youll automatically receive an onscreen notification. Thats your cue to plug your device into any outlet and let it update over Wi-Fi while it charges. Then youll be ready to hit the road again. Driver Alerts: Know Your Surroundings. To encourage safer driving and increase situational awareness, Garmin DriveSmart provides driver alerts for sharp curves, speed changes, railway crossings and animal crossings. Additionally, the navigator will warn you when driving the wrong way on a one-way street and alert you to nearby schools and school zones. Receive notifications for nearby red light cameras and speed cameras, and even get fatigue warnings that suggest potential rest areas after several hours of driving. More Navigation from Your Garmin Smartwatch. Also get helpful driver alerts on your watch. Dont worry about losing your car in a crowded car park; your smartwatch provides compass guidance from your parked vehicle to your destination and back to your vehicle again. Road Trips Just Got Better with TripAdvisor. When youre not familiar with the area, its nice to have something to point you in the right direction. 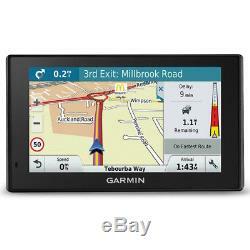 Thats why were bringing TripAdvisor to your Garmin DriveSmart navigator. View ratings for travel points of interest, such as hotels, restaurants and attractions, along your route or near your destination. From the worlds largest travel site directly to your car, were helping you find the stops that make the entire journey part of the destination. Also locate new attractions with the built-in Trip Planner tool, which adds fun to road trips by suggesting interesting stops along the way. Friendly Guidance from Garmin Real Directions. Redefine spoken turn-by-turn directions with Garmin Real Directions. Our easy-to-understand driving directions use recognisable landmarks, buildings and traffic lights in addition to spoken street names, guiding you as if your best friend is sitting in the passenger seat. No more squinting to read distant street signs. Just listen for Garmin Real Directions to tell you, Turn left after the Petrol Station, or Turn right after the red building. Following directions has never been easier. Works with Garmin Backup Camera. Once connected, you can easily see vehicles, pedestrians and other obstacles right on the Garmin DriveSmart display as you move in reverse. The quality of map data can make all the difference between finding your destination and getting lost. High-quality HERE map data enables your Garmin device to provide you with the information you need, when you need it most reducing the frustrations of driving by avoiding delays and cutting down the time you spend in your car. Features detailed maps for Great Britain and the Republic of Ireland, specifically. Isle of Man: Full coverage. THE LATEST IN TECHNOLOGY DELIVERED WORLDWIDE. Newly Overhauled by Garmin and Guaranteed as New Condition. ITEM DISPATCHED FROM OUR UK WAREHOUSE. 14.0x 8.4 x 1.8 cm. WQVGAcolour TFT with white backlight. 11.1x 6.3 cm; 12.7 cm diag. Millionsof Foursquare® points of interest. TripAdvisor®ratings for points of interest. Voice-activatednavigation (operate device with spoken commands). Laneassist with junction view (displays junction signs). Speedlimit indicator displays speed limit for most major roads in the U. Smartnotifications via Smartphone Link app. Freelive traffic and weather with Smartphone Link app. Driveralerts for sharp curves, school zones, red light and speed camerawarnings, and more. Yes, includes external video input for Garmin backup cameras (soldseparately). ThisUSB mass storage device is compatible with Windows. OS X 10.4 or later. Lifetime maps and digital traffic. Vehicle power cable/lifetime traffic antenna. Comes in GARMIN Retail Packaging so makes a Great Gift. The Sustuu Store is a consumer electronics retail website dedicated to top brand-name manufacturers and specializes in the categories of GPS, home/office phones, personal care, pet products, and much more. Interested in becoming a vendor? We at Sustuu are always looking to expand our product line and build strong relationships with manufacturers and distribution partners. Or give us a ring anytime from 09:00 to 17:30 GMT, Monday - Friday, on 0203 0111 888. 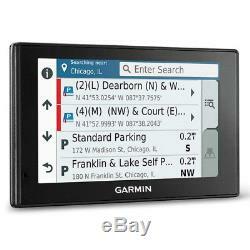 The item "Garmin DriveSmart 51LMT-D UK5 GPS SatNavFREE LifeTime Maps & Digital Traffic" is in sale since Thursday, July 12, 2018. This item is in the category "Vehicle Parts & Accessories\In-Car Technology, GPS & Security\GPS & Sat Nav Devices\Portable GPS Systems". The seller is "sustuu" and is located in Harrow, North West London.